Happy Valentine’s Day! I hope you get something sweet and something that smells wonderful today. Don’t forget you always treat yourself. Here is a quick sweet treat that is gluten free, dairy free and soy free. Chocolate covered macadamia nuts. Grab a bag of whole or half pieces of macadamia nuts and a bag of Enjoy Life Chocolate Chips. Please the chips into a glass measuring cup or bowl and melt in the microwave. I put mine on one minute at a time on high and stir in between until melted. 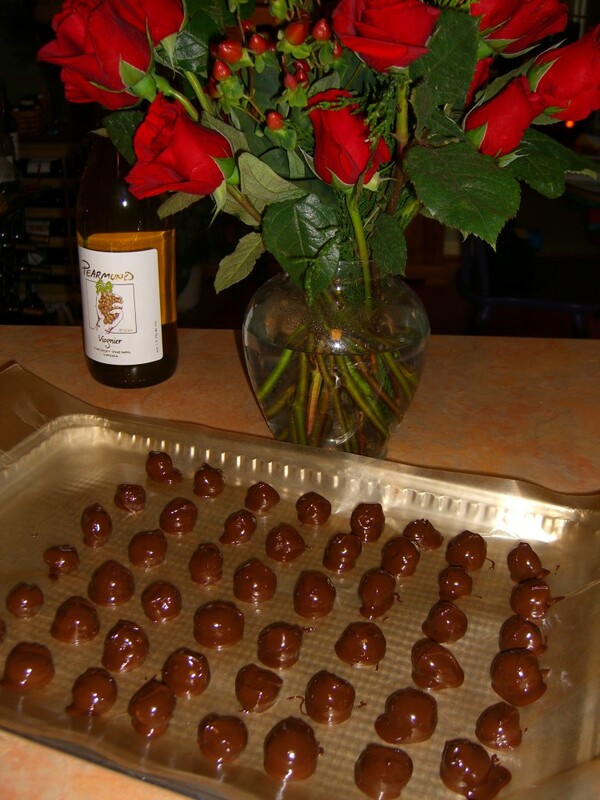 Drop the nuts into the melted chocolate and then place onto parchment paper or wax paper to set up. The rest is up to you. Lick your fingers, the spoon and the bowl. Use the nuts to top of a special dish or serve plain with a glass of champagne or wine. Happy Valentine's Day, Diane, to you and yours. What an incredible treat! Are you single? Wait, I have to be single too for that approach to work. Well… anyway, thanks for the drool! Oh yum! My husband would devour these. Happy Valentine's Day!